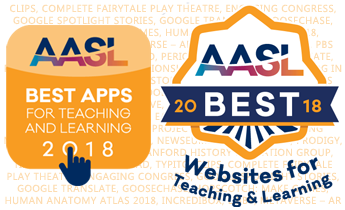 Links, descriptions and websites for both technology lists, as well as previously recognized apps and websites, can be found at www.ala.org/aasl/best. School library professionals can nominate their favorite apps and most used websites at www.ala.org/aasl/best. Nominations for 2019 should be submitted by March 1, 2019; the list of 2019 best apps and websites will be recognized at the 2019 ALA Annual Conference.